Poop Stains? Use the sun to help fade them naturally! 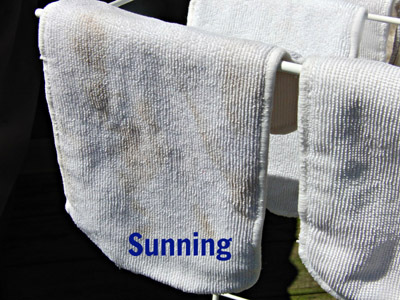 I did my normal washing routine for my cloth diapers. I took them out to put them in the dryer and….EEEEEEKKKKKK!! Look at that nasty poop stain! I mean I knew it might difficult to get it to come out as I was spraying it into the toilet but geesh, my daughter’s bowels did a number on this one. I decided to sun the microfiber insert and then decided I might as well do my entire stash. 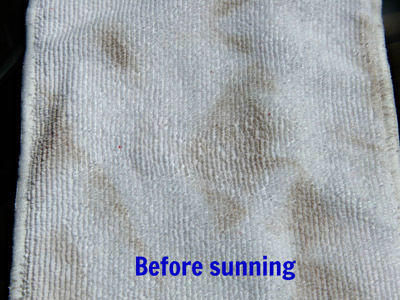 I don’t know if you can tell the difference that the sun made but it’s made some difference. I imagine it’ll take a little while for it to fully come out. I think she ate blueberries and this is the end result. Blueberries are a bear to get out of fabrics. Stay tuned for follow up pictures. I’m excited about this little experiment. 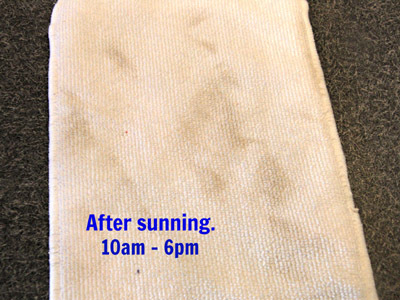 Here are some other posts with great before and after photos that show the effects of sunning your diapers.